Excuse me, sir, may I ask you a question? Are you normal? Seems like a simple question, doesn’t it? There aren’t too many people who think they’re abnormal, are there? Okay, then, let’s talk about “normal” people. Normal has several definitions, but we’ll focus on two: 1) “Standard, average or conforming to the group” and 2) “sane”. Normal people have certain characteristics: They need a certain amount of organization to their life. They don’t want a lot of clutter, so they make sure to keep no more than 3 days’ supply of food in the pantry. They wait until the gas tank is near empty to refill, and have no medical supplies other than a few Band-Aids and some aspirin. Whenever there’s a crisis, whether it’s national (like the 9/11 attacks) or personal (like losing a job), they see before them just a bump on the road. If they stumble, they pick themselves up, brush the dirt off, and continue on their merry way as if nothing had happened. Normal folk don’t feel that there are lessons to be learned. This is because they expect help to resolve the problem, whatever it might be, for them. They pay taxes, so they believe the government will step in and give them a helping hand whenever they need it. The help they expect could be in the form of food stamps in hard financial times, or in swift emergency responses in natural calamities, or in efficient and effective intervention in areas of civil unrest. Various surveys prove that this is the “normal” thinking of most people in civilized countries. Given the definition of “normal” listed above, this attitude certainly is “standard” and conforms to the group, but is it “sane”? Let’s take the case of essential personnel for any municipality. This would include police officers, firefighters, emergency medical techs, etc. In surveys performed in several cities’ police precincts and fire stations, some essential personnel have indicated that they will not report in case of a serious catastrophe, such as a societal collapse. Unthinkable? To some, perhaps. However, these people that we depend upon to rescue us in times of trouble also have wives, husbands, parents and children. Who do you think they will be rush to protect in a truly horrendous emergency: You or their own families? To expect them to do their duty and, at the same time, leave their own loved ones at risk might be a “normal” expectation in our society. That is, after all, what we pay them for, right? Maybe so, but it certainly isn’t “sane” for them to abandon their loved one in times of trouble. So how do “normal” people become “sane” people? By realizing that society can be fragile and that events may occur to send the world awry. Once things happen that knock us off-kilter, a downward spiral will make life difficult. Certainly, it will be difficult for all, but less so for “Preppers”. 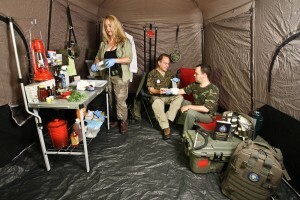 Preppers stockpile food and supplies for use in the event of a catastrophe. 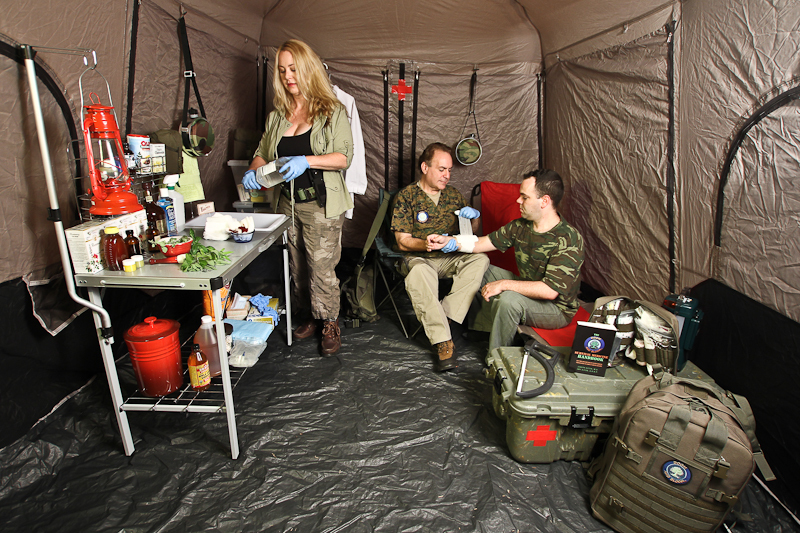 Preppers also take time to re-learn skills largely lost to modern urbanites/suburbanites; skills that would be useful if modern conveniences are no longer available. What types of events could cause such a turn of events? There are various scenarios that could lead to times of trouble: Flu pandemics, terrorist attacks, solar flares, and economic collapse are just some of the possible calamities that could befall a community or even a country. You might say, “the chance of something like that happening is minimal”. True, the likelihood of any one of these life-changing events in the next few months may be very small, but what is the chance that NONE of these events will occur over the course of your lifetime? Preppers see the writing on the wall; unlike the oblivious majority, they face perilous circumstances with a “can-do” attitude. Instead of facing an uncertain future with fear and desperation, they are using this opportunity to learn new skills. Many of these skills were common knowledge to their ancestors, such as growing food and using natural products for medicinal uses. By learning things that are useful in a power-down situation, they increase the likelihood that they and their loved ones will succeed if, god forbid, everything else fails. If a calamitous scenario transpires, they will be prepared for the worst, even while hoping for the best. This is not to say that preppers are eagerly waiting for some terrible series of events to bring society down. They want nothing more than to die at age 100, with their grandchildren whispering in their ear “Gee, Grandpa, what the heck are we going to do all with all these supplies?”. They view their preparations as insurance. You buy health insurance, but that doesn’t mean you want to get sick; you buy life insurance, but you certainly don’t want to die. Being prepared is insurance as well. Instead of paying money for something that isn’t tangible, you’re buying food, medical supplies, and other things that will ensure that you and your loved ones will do well regardless of what slings and arrows life may throw at you. The road to self-reliance is a long and winding one. It will take some of your time and some of your energy to become self-sufficient. It will take some of your money, as well, to accumulate things that will be useful in obtaining a head start to success in dark times. This can still be done frugally. A 50 pound bag of rice, for example, is still under $20 at the time of this writing. Many of the products that will be useful in a collapse scenario can also be improvised. A bandanna and a stick will be almost as good a tourniquet as a high-tech, commercially manufactured one. Look at what you have in your home and consider the ways that an item can be used in a survival situation. A realistic assessment of your stores will give you a good idea of how prepared you are for an unforeseen event. Where are you deficient? What purchases or improvisations will offer you the best opportunity to face an uncertain future? What skills would be useful to learn? Benjamin Franklin once said: “When the well is dry, we learn the worth of water”. The same can be said of many aspects of modern technology. If you are thrown into a situation where there is no electric power, how many items in your house will be useless? Consider the ways that you will get power. For most people, there are a few un-rechargeable batteries in a drawer somewhere. This may get you a few hours’ worth of flashlight or radio use, but what then? It’s important to have a strategy that will give you a steady supply of at least minimal power. Switch to rechargeable batteries, and get a solar battery charger so that you can keep a renewable power source in your possession at all times. Consider the various other options, such as propane gas, wind power and solid solar panels with marine batteries. You don’t have to be an industrial engineer or an extremely wealthy person to put these together. You just have to be “sane”. Add some motivation and perhaps a little elbow grease, and you’ll be on your way. Are you ready to deal with medical issues in times of trouble? Check out our Amazon bestseller “The Survival Medicine Handbook” for information you’ll need if the ambulance isn’t heading your way!